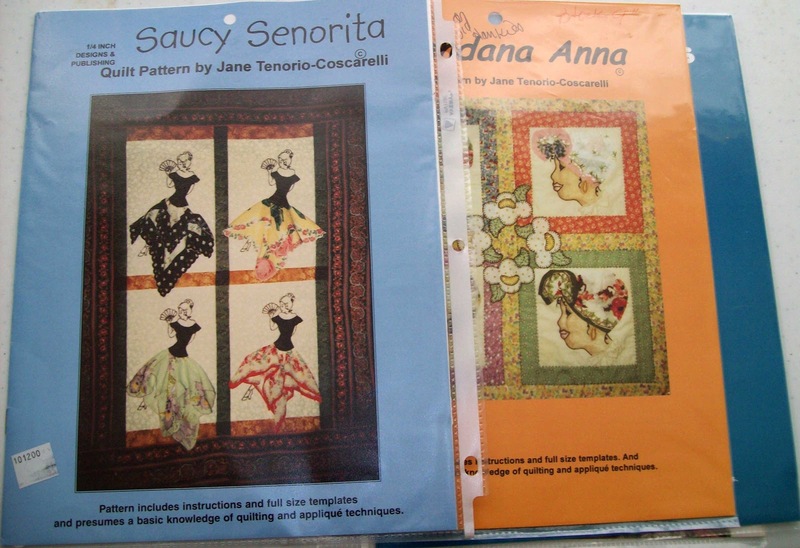 Last week a small lot of 6 quilt 'women' wall hangings caught my eye on Ebay. I waited until the last second, of course, and placed my bid; promptly paid my $15.00 ... and waited. This is two of them .. the others are similar, just different ethnicities. I went out to pick up the mail yesterday and they were here. Now, our mailman Bob (who will only walk up to the door if there is no way around it), had stuffed the Flat Rate Envelope into the mailbox. It was in there so tight, that I actually had to tug in out with one hand while holding the mailbox in place with the other hand, keeping one foot on the pole, just so I didn't pull it out of the ground. Seriously; this is only a slight fabrication. Heading back to the house, I was thinking that these patterns are typically a couple pages each and I was expecting the whole package to be about 10oz, not nearly 3 1/2 pounds. It didn't take much to get it open; the tug-of-war with the mailbox had already put a couple substantial tears in it. And, what did I find ???? Well, there were the 6 patterns that I had purchased along with alot of other stuff. Let's see, odds and ends of some stitchery kits, misc. 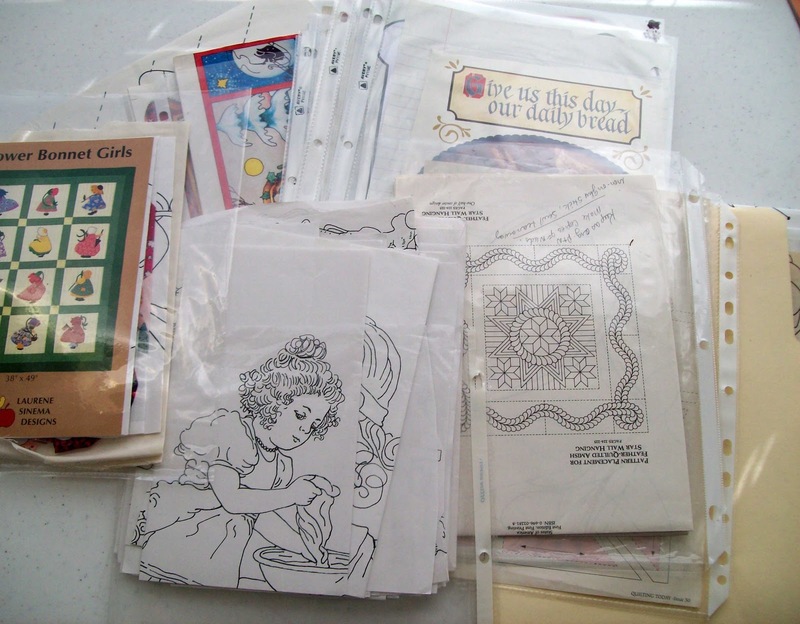 about a dozen iron-on transfers, a couple stitchery kits, along with a fair amount of other loose stitchery pages. 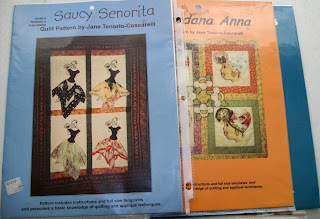 Also, three of four large quilt templates, and other sheets with quilt template borders and then a couple little packs of partially cut out (fabric included) applique pieces. So, I'm standing in my studio thinking ... What's up with this ... when my eyes land on one of my stacks of stuff (I know I cleaned them out two weeks ago; but they are re-accumulating). And the idea hit home. My biggest problem with my stacks is it is typically 'Good' stuff, quite useable, but I don't have a designated place or system for it. Thus, it just stacks up awaiting a decision. And, the reality of my stacks are, when I finally get to them it's usually stuff I just get rid of ... Freecycle or local thrift stores. Which got me to picturing the shipper mailing me these 6 patterns. Since I'd paid for a flat rate envelope, she's just gift me one of her stacks. Like a freebe. They are now in my stack ..... I'll have to consider this concept next time I upgrade someone to a flat rate envelope and there is some room left over.